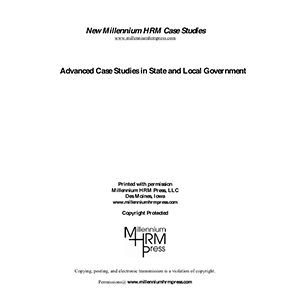 Utilizing 40 cases packed with more than 150 administrative, management, and policy issues in the non-profit and public sector, Managing Public Service Organizations is the ideal teaching and learning resource for all levels of government, certified public manager programs and nonprofit organizations. Professional administrators and board of directors will greatly benefit from this book along with university students at the undergraduate and graduate levels. For convenient instructor and student use, the cases are conveniently indexed by major and minor topic discussed. Each of Managing Public Service Organizations’ specific cases, spanning more than 330 pages, connects theory with practical application for all levels of learning. The thought-provoking cases are written to reflect the real-life experiences of administrators and the kind of problems professionals will likely face in the entry- and middle-level, and higher executive positions they will hold upon graduation. This cutting-edge resource may be used as the primary text for courses employing the case study approach or as a supplement to instruction by textbook and lectures. In addition, the case studies may be used in graduate seminars or as an aid to professional development programs. Unless I’m mistaken, years ago science fiction consisted of far-out notions such as “The earth is round,” and “The earth is not the center of the universe.” Look where such free-thinking has gotten us. Today’s managers must be much more creative and intellectually diverse than ever before. Science-fiction stretches the notion of what is attainable in creative and previously undiscovered ways. Management must be ready to adapt to situations that were not present in the organization 5, 10, even 20 years ago. Take the extraordinary, apply it to the ordinary, and see what happens. Thinking outside the box is crucial in management. Why not use material from the experts in outside-the-box thinking, and apply it to real, concrete situations from our world today? 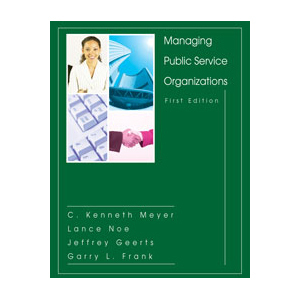 Managing Public Service Organizations, in addition to issues of contemporary origin, includes cases that cover “standard fare” topics such as: centralization; decentralization; time management; ethical dilemmas; accountability; responsibility; public’s interest; good government; responsibility; leadership; decision-making; and delegation of authority. Managing Public Service Organizations also addresses hot topics of today including: quality management; work-life balance; reorganization; reinvention; outsourcing; executive-board relations; e-government and commerce; workplace violence; contagion theory; and ecological impact. To assist instructors, a sample syllabus is provided on this Web site covering everything from course objectives, to grading and case assignments. Be the first to review “Managing Public Service Organizations” Click here to cancel reply.